Recorded in New York , January 12 and 14, 1962. 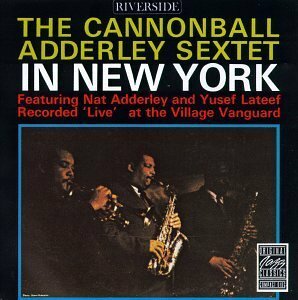 The saga of Cannonball Adderley's band, which has unquestionably been one of the most dazzling success stories in modern jazz history, has been highlighted by recording sessions of the most 'modern' kind-on-the -job, in-the-club albums that have only become possible because of the improved tape-recording and microphone techniques and equipment of recent years. When a jazz group is the sort that responds vividly to audience reaction, and when it also provokes great excitement and enthusiasm among the customers, an in-person recording can be an emotional and musical experience of awesome proportions. And I can think of no combination of jazz musicians who surpass Cannonball's crew in this dual ability to stimulate and be stimulated by a club full of avid listeners. This was overwhelmingly demonstrated very early in the band's existence, when they were recorded on the job at the Jazz Workshop in the Fall of 1959. That was actually a rather accidental happening-we were anxious to bring out an album by this newly formed quintet as swiftly as possible, San Francisco was the scene of their first extensive engagement, and that otherwise wonderful city doesn't particularly have recording studio facilities. So we brought our equipment into the club, and the result was "The Cannonball Adderley Quintet in San Francisco"-a most gratifyingly best-selling phenomenon whose virtues included a remarkable atmosphere of audience participation. The present album can be considered something of a companion piece to that first LP, created just over two years after it and at the other end of the continent. It presents a group that is rather more mature in terms of self-assurance and experience in working together, but every bit as electric and spirited as it was then. Four members of the unit have been on hand since the start : Cannonball, the country's top-ranked altoist ; his brother, the brilliant cornetist Nat Adderley ; and the incomparable rhythm team of bassist Sam Jones (who, like the Adderleys, could attribute much of his down-home jazz feeling to having been born down in Florida) and Detroiter Lou Hayes on drums. Their pianist, who joined the band in the Summer of '61 but is recording with them for the first time here, is Joe Zawinul, born and raised in Austria, whose playing manages to disprove a great many geographical and racial cliches about jazz. Yusef Lateef, a second emigrant from Detroit and a big-toned tower of strength on tenor sax (and flute and oboe), was added to the group only three weeks before this recording was made, thus turning it into a sextet. There seems no need to comment on the fact that Yusef was instantly assimilated into the group, or on the equally important facts that he has never sounded better than in this context and that his presence appears to have really fired up all concerned. All this is thoroughly evident on the LP, with the seemingly impossible result that the most fiery and soulful of jazz bands now sounds even more so. As befits a 'live' date, the album has been put together much in the pattern of an actual performance. It opens with a few trenchant observations by Cannonball, who has long established himself as a rarity among bandleaders by invariably seeking to warm and welcome his audiences and to tell them what's going on. Then the sextet launches into the strong and compelling jazz waltz, Gemini, named for the zodiac sign of the Twins and written by tenor sax man Jimmy Heath, a close friend of the Adderleys and himself a Riverside artist Lateef states the theme on flute, and later follows solos by Julian and Nat with some soaring tenor comments. Then there's an ensemble interlude well worth special mention-not only on this album, but just about every time the band has played this tune, it draws applause, possibly the only time a mid-way ensemble chorus has consistently grabbed audience approval in this way. Lateef's Planet Earth (Cannonball is apt to describe its title as "insurance-it's how to make sure where we're at") is a lusty number that displays how well the band now uses its three horn status to construct effective backgrounds for the soloists. The second side is a good example of a the variety and pacing of a typical club set Dizzy's Business is a swift-moving "opener." (It was originally written, by Ernie Wilkins, for Dizzy Gillespie's big band and , as Cannon sometimes puts it : "Dizzy's business and our business are pretty much the same thing-to swing.") Lateef's Syn-anthesia , which utilizes his command of the oboe, is a strange and delicate piece ; Yusef explai'ns its title as referring to "a mixture of the senses." Zawinul's Scotch and Water is a rocking blues that features solos by the leader and the composer. Lastly there is a closing theme, written by Sam Jones, that is more than just a curtain-call device : after Cannon introduces the cast, they proceed to blow up a final storm that leaves the crowd clapping, beating time, and obviously reluctant to have things end-which is not at all an unusual way for an Adderley set (or record) to come to a close.